Today there are dozens of myths associated with the production of the ordinary things. One of the most strange and frightening for colored stripes on the tubes of toothpaste. Don't quite know where the belief that the stripes on the tube, you can find out what percentage of creepy, poisonous chemicals contained in the sample of toothpaste. Black stripes supposedly talking about the absolute origin of the chemical paste, the blue - about the fact that pasta contains not more than twenty percent natural ingredients, red allude to the fact that the chemicals in the paste contains exactly half, and the green report of its completely natural origin. Less common myth claims that the strips are talking about the purpose of the paste. Blue allegedly caught on paste for daily application, red – pasta medicinal purposes, which it is not necessary to use more than a week, the green strips on the tubes tell about things through the influence of paste, and black is paradoxically talking about the whitening effect of the toothpaste. And what are the stripes really? In fact, all this is very far from the truth. Strips on the tube can be a special marking, the so-called "bubble-jet". This marking is applied during movement of the tubes along the conveyor. It serves to indicate barcodes. The customer can choose the height and color of marking. These marking inks are applied in a contactless manner, while the product moves on the conveyor belt. And they can be any color. Quite often, the color marking stripes depends additionally on the main color of the packaging, because they should be well marked. Sometimes colored stripes will serve as cutometer, that is, marks that are easy to read sensors of the machines, which cut and solder the tubes of toothpaste. All of this in each case depends on the manufacturer. Of course, there are cases when the colour stripes simultaneously perform both the functions of the technical labels – serve as a basis for applying bar codes, and at the same time and suggest automation incision and soldering. 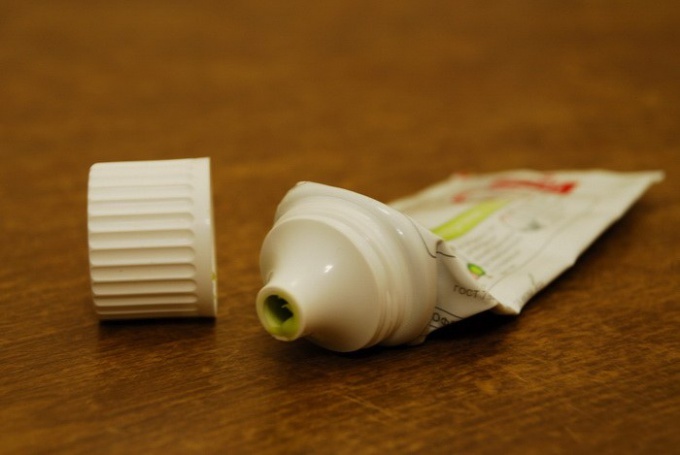 In any case, you should not rely on these strips at the time of purchase of toothpaste. Better acquainted with the composition, look for harmful or cause issues components. Composition is sometimes hard to read. Because it is typed in small print. If you have a problem with that, try to find the part you are interested in the pasta on the manufacturer's website.